Not all VoD is the same! This has always been Channel 4’s belief and in talking to people across the industry, we definitely weren’t the only ones. What we did find, however, was that there was little consumer evidence around to support this widely held hypothesis, so we teamed up with COG Research and neuroscientist Dr Amanda Ellison (not once, but twice!) to delve a little deeper into how people are watching VoD. We first ran the Not all VoD is the same study back in 2014, then followed up with a more granular look at the findings in a second study (Not all VoD is the same 2) in 2016. From experience, we know that people find it difficult to articulate how or why they watch something, so we used pioneering implicit research techniques to help capture people’s viewing in a natural setting. For both versions of Not all VoD is the same, we set up our qualitative respondents with eye tracking glasses to track their attention to the screen and skin sensors to track their brain activity. In the second study (Not all Vod is the same 2) we also asked a subset of our qualitative respondents to download screen recording software on their devices to capture all VoD usage over a week. 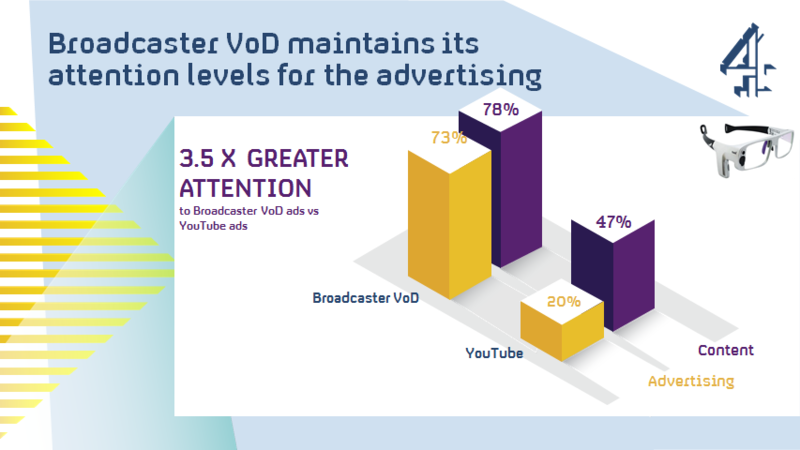 When we analysed the output from the eye tracking glasses, we saw that respondents’ pupils were on the screen for 73% of the time the ads were playing on Broadcaster VoD, versus just 20% for YouTube. The skin conductance receptors showed us people’s brain activity while watching both content and ads on Broadcaster VoD and YouTube. 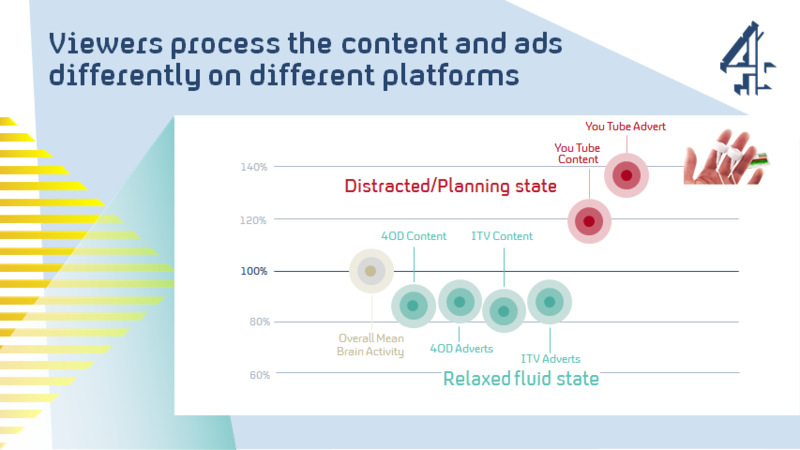 Results showed that not only is there little variance in brain activity when moving between the content and ads on BVoD, but they’re also watched in a relaxed state meaning the brain doesn’t work very hard to process what it’s seeing. YouTube, on the other hand, was watched in a distracted or planning state. Alongside the qualitative study we also used implicit response testing to quantify the findings. 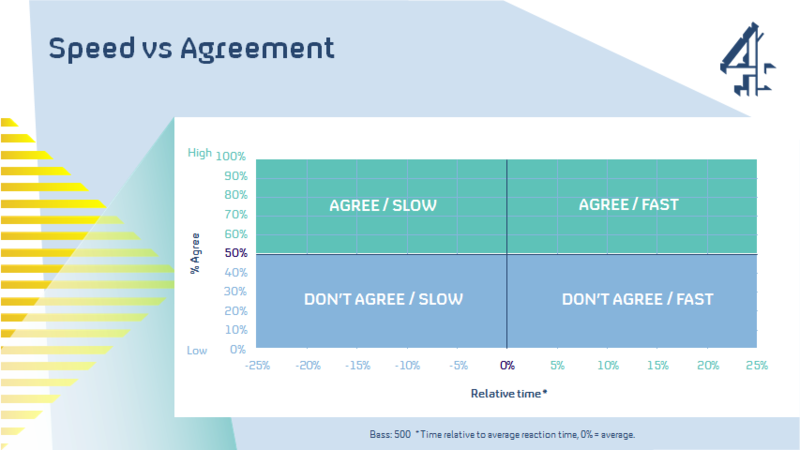 We asked 1000 respondents to answer about their perceptions of different VoD players, with the speed of their answers revealing how strongly an opinion is held by an individual. 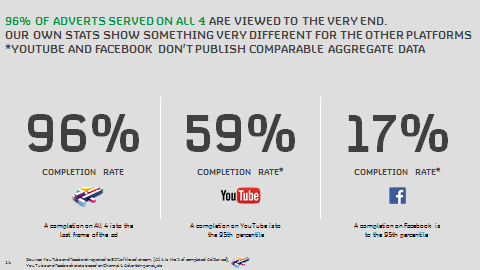 Results showed that All 4 stood out above the other VoD players on the quality metric. We were able to take a more detailed approach to attention in the second study by combining the data from the eye tracking glasses and the skin conductance receptors, rather than looking at them side by side as we did the first time around. In the highest state of attention, viewers often show explicit reaction to the content and their level of involvement peaks. However, even towards the lower end of the attention spectrum (everything in green), we saw that brain activity was relatively relaxed and therefore receptive, allowing for emotional messaging to be taken in. 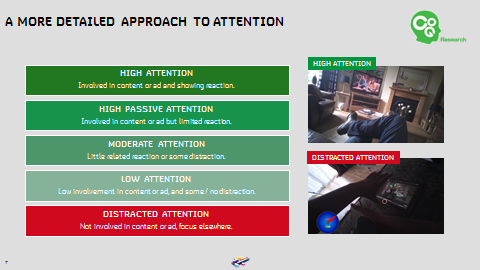 The distracted attention state is the ‘enemy’ of advertising, with the brain struggling to do 2 coordinated things at once. When we looked at this for All 4 and YouTube the level of distraction time for ads on YouTube was 3.1 times the figure for All 4. We saw from our qualitative research and the hours of passive viewing collected from the screen capture software that the adverts on All 4 are more likely to be watched in full screen mode and with sound. We can also see from our own internal metrics that ads on All 4 are more likely to be watched through to the end, with a 96% completion rate. As you can’t skip the ads on All 4 it’s only not 100% as some people abandon the viewing stream mid-ad. 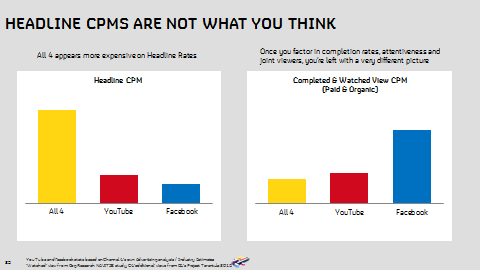 Looking at Headline CPMs, All 4 can appear more expensive, however when we factor in attention levels, completion rates and organic views, you can see how All 4 may be better value for your money than you may think. >20% less than YouTube and a third the cost of Facebook.